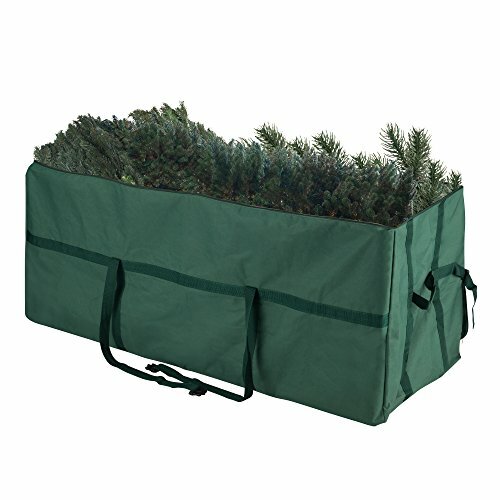 Clean up after the holidays are a snap with the Deluxe Heavy Duty Christmas Tree Bag from Tiny Tim Totes. If your tree is something you want to keep for years to come you want a bag that will keep it safe and good as new year after year. The Tiny Tim Totes Deluxe Christmas Tree Bag is what you are looking for. Made of heavy-duty canvas, quality zippers and straps with buckles, this bag will last as long, if not longer than your tree. Within minutes you can go from a fully standing tree to a neatly stored away treasure with very little effort. Specifications: Fits trees up to 7.5 feet tall unassembled. Includes (4) 7.5 foot adjustable 1" straps to bind the tree segments. Made of high impact tear-proof canvas. Sturdy Carry Handles for easy transporting of your tree. Moisture resistant, keeps out dust and pests. Folds flat when not in use. Measures 48" L x 24" H x 24" W. Full 1 Year Warranty. ► LARGE: One bag is large enough to hold a 7.5-foot disassembled Artificial Christmas Tree. Dimensions 48" x 24" x 24". ► PROTECTIVE: Protect the center of your Holiday Decorations with this water, stain and tear-resistant artificial Christmas Tree Storage Bag. ► STURDY: Our Christmas Tree Bag has reinforced nylon handles so you can tote your Christmas cargo with less effort. ►DURABLE: Built to last year after year and protect your Christmas Tree from dust, mildew and rodents.